Dietary supplements like vitamins and minerals are generally considered safe to take as long as you don’t exceed the recommended dose– you are not likely to hurt yourself taking things like vitamin D or magnesium. However, if you take herbal supplements, sports supplements, or weight-loss supplements, please use caution. A recent study has found that hundreds of these supplements actually contained prescription medications, and the FDA has contacted these companies to issue them warnings. Dietary supplements, unlike prescription pharmaceuticals, are not regulated by the FDA. This means that the supplement-makers do not need the FDA’s approval before they market and sell their product– they are basically on the “honor system” to regulate their own ingredients and to make sure that the quality, active and inactive ingredients, and amounts are what they claim. For example, let’s say you make a vitamin C supplement and claim there’s 500mg of vitamin C in each pill. But maybe there’s actually only 400mg of vitamin C in each pill. The FDA cannot regulate this, and nobody ever really knows until an outside study is done and people realize they’ve been paying for 500mg pills but only getting 400mg. Okay, that’s a pretty harmless example. Weight loss supplements seem to be where the biggest problems are– many have been analyzed over the years and some have found to test positive for certain stimulants which were not mentioned in the ingredients list. This could be a dangerous situation and could cause many side effects. It is always important to share your dietary supplement choices with your doctor and only choose supplements that come from a trusted, well-known, reputable source. Your doctor can help you choose the best supplements for your body and health concerns. 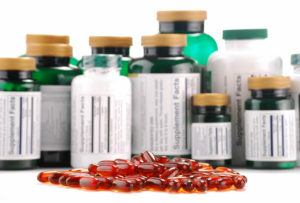 Kenneth, Lin W. MD, MPH “More Bad News About Dietary Supplements.” https://www.medscape.com/viewarticle/903925. November 5, 2018.